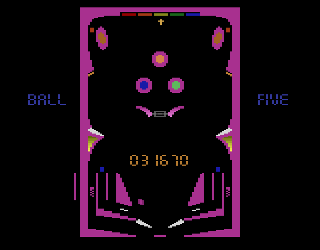 This game makes the earlier Video Pinball for the VCS look downright awful. Midnight Magic’s colorful, high-resolution graphics and realistic ball physics make its predecessor look like something from the previous generation. The game features a single table with more plausible dimensions (long and narrow) and more realistic-looking round bumpers. The play field is still simple but better replicates an actual pinball machine, though perhaps one from the 1960’s-70’s and not the more complicated tables prevalent in the 1980’s and beyond. For an Atari title, the game has respectable physics and aside from the primitive graphics does a decent job of approximating the pinball experience. Simplicity and a lack of visual flair aside, a video pinball aficionado like myself can easily burn a hefty chunk of time trying to rack up a high score. My biggest problem with Midnight Magic is actually a problem with the Atari’s controller. To manipulate the flippers, you press either right or left on the joystick, meaning that you can’t operate the flippers independently of each other. In other words, in order to use one flipper you have to be NOT using the other. Your only other alternative is to push the joystick in the down direction, which activates both flippers simultaneously.The game would work great with a Track & Field Controller which has separate buttons for left and right, but with no way of pushing in the down direction, there is no way to pull the plunger back. Still, this is an obstacle to be overcome and not a fatal flaw in the game. This is one of the more impressive games that I’ve played on the Atari, particularly considering that it’s a first-party title. If you like pinball games as much as I do, this is definitely a game worth buying. Buy Midnight Magic on GameGavel or Amazon. Tagged 2600, Atari, Midnight Magic, Pinball, Review, VCS. Bookmark the permalink.